Easy DIY shoe repair tricks for all shoes including high heels, boots, flats and sneakers. Try the following quick fixes for longer lasting shoes. • Small nicks can be filled in with a dab of similarly colored nail polish. • Or, color over the nick with a permanent marker pen (same color as your shoe) and seal with a coat of clear nail polish. 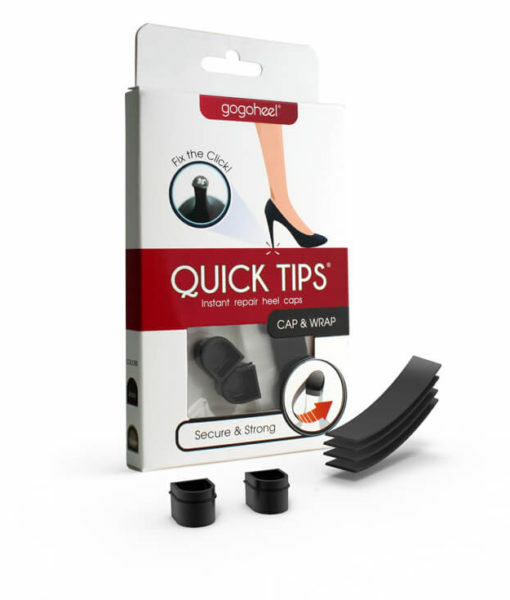 Repair worn heel tips instantly with GoGo Heel’s QUICK TIPS® Heel Caps. Caps cover the metal nail to instantly stop the clicking sound. 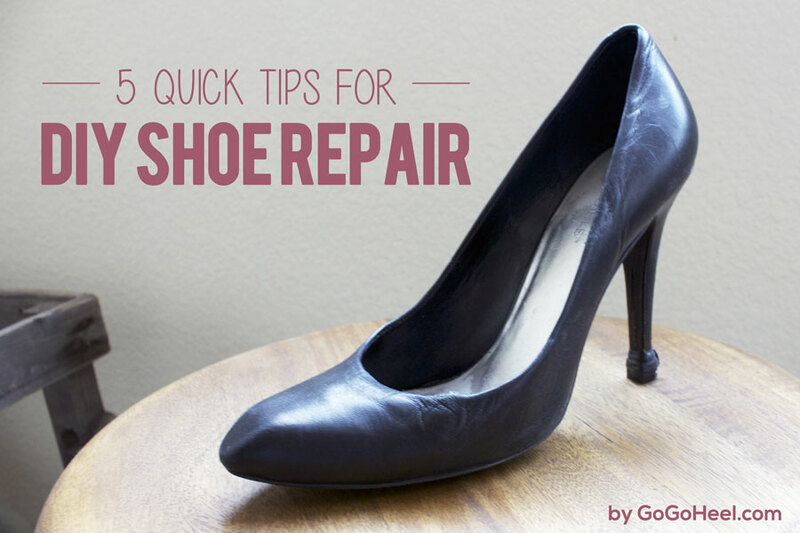 Perfect if you don’t live near a shoe repair shop or are looking for an easy & affordable DIY solution. 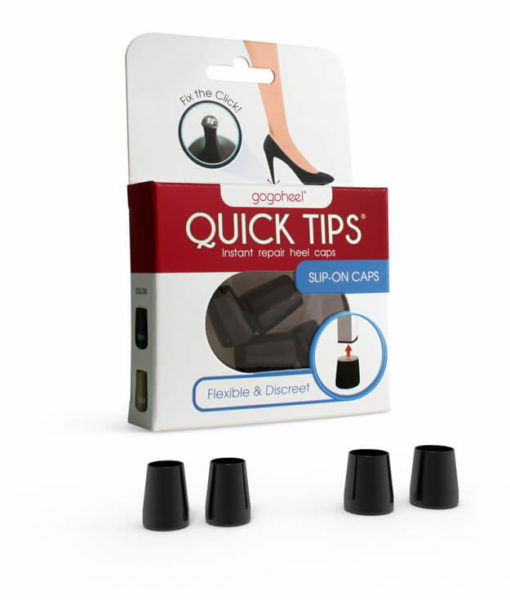 Directions: Measure your heel tips to find the tightest-fitting cap size. Slip cap over your heel. 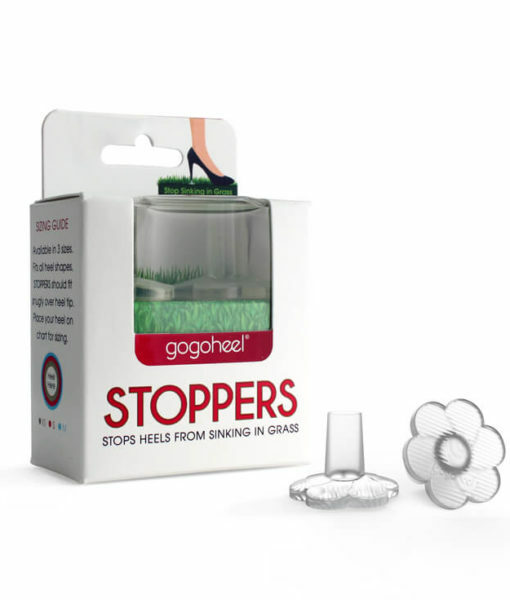 If you’d rather replace your heel tips instead of using a heel cap, you can order replacement heel tips online, or ask your local cobbler. Unfortunately, replacing your heel tips can be tricky. The metal pin can be very difficult to remove and you have to get the correct pin size for it to work. Time: About 10 minutes. If you cannot remove the old heel tip, you’ll need to go to a professional shoe repair. Directions: Before ordering your new heel tips, remove your old heel tip with pliers & measure the metal pin diameter to ensure that you order the right pin size. To install the new heel tip, remove the old tip and hammer in the new one. A heel tip comprises of a rubber part and a metal pin. Since the pin is nailed into the heel shaft, replacing your own heel tips can be tricky. Removing the old tip requires pliers. It can be difficult to get a good grip on the nail and unsuccessful attempts erode the nail head. Heel tips have different pin sizes. Before ordering your new heel tips, remove your old heel tip & measure the pin diameter to ensure fit. Read: Heel Caps vs DIY Heel Tip Replacement. For shoe repairs, always use Shoe Goo or a good contact cement for a strong yet flexible bond. Never use super glue or gorilla glue, because it drys hard and will not flex after it has set. Shoes need to be able to flex and bend with your feet and movement. Also, super glue will ruin leather, so beware. Follow Shoe Glue’s instructions closely for best results. • Treat leather shoes with a protectant spray when it’s new. • Waterproof shoes on a regular basis to protect is from rain, spills, and stains. Bees wax works great on canvas shoes. For leather, suede, nubuck & other textiles, use sprays with nanotechnology (like Nanopro). • Shoe polish covers light scuffs on dark shoes. Use cream or paste polish as it’s more effective in repairing nicks & scratches. Liquid polishes dry out the leather. • For smooth leather, apply leather lotion — it’s colorless — to the scratched or nicked area to moisturize the damaged part. Then, apply cream shoe polish — use same color as leather — over it. Finish with buffing the area using a soft, dry towel to make sure the polish blends in well. • Mr. Clean Magic Eraser is amazing for removing marks, grass stains, and scuffs. Remember to always spot test on a hidden area to make sure it’s compatible with the shoe material. • Glass cleaner removes scuffs & polishes patent leather. Vaseline also works well. • Rule of Thumb: Clean/Repair suede material when it’s dry. • Use a suede brush to get rid of any surface dirt. Brush it in the direction of the fibers rather than going back and forth. • To remove minor marks and scuffs, gently rub an eraser over the discolored spots. The friction of using the eraser lifts the dirt and fluffs up the suede fibers. Try this on your suede purse and jackets too! • Armor All Multipurpose Auto Cleaner is an excellent cleaner for any vinyl material. It gets out stains & fixes minor scuffs. Are your new shoes a little too tight or a half size too small? An easy DIY trick to stretch out your shoes is with a simple bag of water. Fill your shoe with a bag of water and put it in the freezer. It works because water EXPANDS when it freezes! Try this fun science experiment the next time your shoes need a small stretch. Works best on leather shoes. 1) Fill the plastic bag about 1/4 – 1/3 with water. Double bag to be really careful. 2) Seal the bags and try to get as much of the air out as possible. Tie the top up with a string or rubberband to be extra safe against leaking. 3) Position bags in your shoes and freeze for a few hours. 4) Once frozen, take the shoes out and thaw out for 20 mins. 5) Remove the ice bags, wipe down your shoes, and try them on! Tip: For closed-toed shoes, it’s easier to first place the double plastic bags inside the shoe as far as you can, then carefully pour water into the bag to allow it to take the shape of your toe box. This entry was posted in Shoe Repair and Care and tagged DIY, shoe repair.